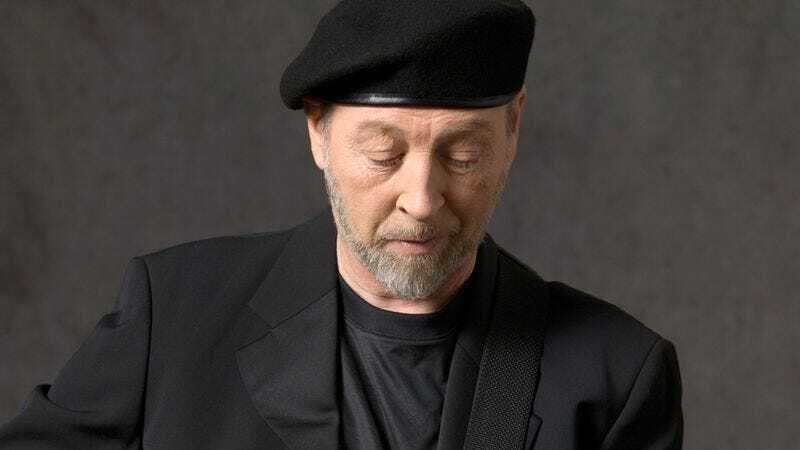 Richard Thompson's gifts as a guitarist and songwriter have been apparent since his teenage days in the 1960s British folk group Fairport Convention. Albums like 1982's Shoot Out The Lights (with then-wife Linda Thompson) and 1992's Rumor And Sigh earned him critical praise and a loyal fan cult. He's out now with his first new electric disc in three years: Sweet Warrior features a sizzling antiwar song in "Dad's Gonna Kill Me," told from the perspective of a disillusioned American soldier stationed in Iraq. From his Los Angeles home, Thompson recently talked with The A.V. Club about his albums, his songwriting, and how his personal life works into both. The A.V. Club: You tend to alternate between full-band electric and solo acoustic, both in your albums and on your tours. Do you have a preference between the two? Richard Thompson: Not really. I'm glad I can do both. It's nice to have contrast, so if you get fed up with one, you can just switch to the other one. It's great to go to a town and play an acoustic show, and then you can come back a year later and play electric, and the show's really fairly different. The repertoire will be 50 percent different. The musical energy is completely different. AVC: You also seem to keep a stronger connection to your audience during concerts than many musicians do, talking and telling stories instead of just playing songs. RT: Well, it's probably because I came more out of folk music, in which you kind of have to talk to people, otherwise you're considered kind of a stuffy, stuck-up git. I wish I'd never spoken onstage in my life, though, because there's so much mileage in being the tortured poet. I wish I'd done that, but it's too late to start now. I think it would be spotted as a ruse. AVC: Sweet Warrior's overall theme is about conflict, from war and terrorism to relationships that break down. RT: I think "conflict" could be the key word, and it's certainly what I was thinking of as I chose these songs for the record, from a list of about 20. I thought these kind of hung together, and that the commonality was this idea of conflict—relationship conflict, military conflict, social conflict, all different aspects of that word and its resolution. You know, the sweetness after the war, if you like. AVC: It's unusual for you to write such overtly political songs as Sweet Warrior's "Dad's Gonna Kill Me" and "Guns Are The Tongues." RT: I think there are shades of political songs; some are more subtle and can be more effective for being subtle, for being more metaphorical. I've written a lot of songs like that, where it's not really clear if it's a war song or a relationship song. The metaphor can be the most powerful thing of all, but sometimes you have to speak more clearly to more people, and I think this is one of those times. AVC: What sparked you to write "Dad's Gonna Kill Me"? RT: I was interested in the language of the soldiers in Iraq—I like language and jargon and slang. There was great slang that came out of World War I and the Regency period, the Napoleonic period, Elizabethan. Soldiers had great slang. So I was researching, for my own amusement, some of the websites that have G.I. poetry and G.I. rap lyrics and stuff, some of which is really bad, but the language was interesting. I was interested to see these phrases like "Dad's gonna kill me," referring to Baghdad, and "Dad's in a bad mood," "Dad's got the blues," all these expressions that they use. I built this song out of the jargon, and then realized it was impenetrable to anybody outside of Iraq, so I modified it a bit and made it more accessible. I suppose it's almost an afterthought that it's an anti-war song. My first sympathy was with the troops and trying to write a song through the soldiers' eyes, and the day-to-day stuff that they're dealing with. And secondarily, it's a song that's against the fact that they're there in the first place. AVC: Have you heard any responses from people serving in Iraq? RT: [Laughs.] Yeah, all kinds of responses, because it's up on my website and it's been on some political blogs as well, as a download. Feedback from the soldiers is mostly positive. On the whole, they like it and they think it's kind of telling their story. Troops' families generally don't like it. I get pretty good hate mail from families with soldiers, who think their kids are fighting for freedom and democracy, which are two things this war is definitely not about. And from the general public, it's kind of mixed. When I play it in concert, it's a mixed reaction. Some people have walked out of shows, people have got up and shouted abuse. I suppose on the whole I have more of a Democratic than a Republican audience, so on the whole, reception is positive. In concert, people cheer certain lines. I think I'm generally speaking for the majority. AVC: How comfortable are you with putting elements of your personal life in your lyrics? RT: If you're up on a stage, naked and solo and singing songs to people, there's not much place to hide, so you may as well confess what you want to confess and say what you want to say, whatever that is. Some songs just turn out as being more about me, and some are more through the eyes of other people, or third-person descriptions of people. I don't really know how this process happens, how these songs are arrived at. One of the things I like about the writing process is, I don't necessarily know where it's going, and even if I think I know where it's going, it'll turn out different. I find that exciting and rewarding. The good part of writing is where it gets out of your control and turns into something else. You look at it and think "Whoa, where did that come from? That wasn't what I meant to write, but it's more interesting than what I was intending. Which part of my subconscious or my experience did that come from?" Often the answer isn't clear, and often the line between fiction and fact isn't clear, either. I think some songs, you can say, "This is about me, about my life. It's just very clear, you know, this verse, this verse, this verse." Other songs—I'd say most songs—it's harder to tell. I don't really do a lot of self-analysis about that kind of stuff. It happens, and I just accept it happens. I can look at it and critique it afterward, and throw it away or keep it if it has any value. AVC: Is playing new music in front of an audience important to help you figure out which parts of a song work and which don't? RT: Yeah, although I wouldn't like to play every song in front of an audience first. It's nice to get some things fairly settled before you go in a studio. An audience will let you know if a song communicates. If you see them kind of falling asleep during the song, or if they clap at the end of a song, then they're telling you something about the song. [But] you can have a good song that doesn't communicate. Perhaps that isn't a song that you can sing to people; perhaps that's a song that you sing to yourself. And some songs are maybe for a small audience, and some songs are for a wide audience. But the audience will let you know pretty quickly. If you're up there performing a song for the first time, it's as if you're hearing it through their ears. You become acutely self-conscious of the song in performance, so that's a good thing before recording. But I like to have some surprises for the audience; I don't want the audience to know everything that's going to be on the record, because these days, with the Internet, people become avid collectors of pre-knowledge. They want to be the first with the record, they want to be the first to know which songs are on the record, all that kind of stuff. So I like to just stall them a bit. Personally, I love the idea of an album that's completely new, that no one's heard any free downloads, any pre-record releases, all that kind of stuff, and nothing's been played on the radio. Totally virgin, you know, a sealed record. That's my ideal, but it's very hard to get anybody else to agree to do that. AVC: You left Capitol Records in 1999 after Mock Tudor, and since then, you seem to be pretty happy as an independent musician. Do you feel creatively freer now? RT: Absolutely. I'm more able to make the records that I want to make, be it an electric record like this one, or a smaller project. Over the years, I've had fairly benign record companies who gave me a lot of rope, but in spite of that, there's still restrictions and expectations. It's nice to be at the cottage-industry size, which I think is kind of the business model of the age anyway. It's the way to be. The Internet makes a lot of that possible. Having a loyal fan base is also very useful to keep me operating; people can find your website, and the venues that you're playing at, the merchandise you have for sale, all that kind of stuff. It's great to be able to reach the audience in a more direct way. AVC: You converted to Islam in the '70s. That hasn't shown up in your music overtly, apart from songs like the anti-al-Qaeda "Outside Of The Inside," and obliquely in "Dad's Gonna Kill Me." How does your Sufism inform your music? RT: I think whatever you believe in affects whatever you express, whatever you create. It shapes your morality in some way. But I don't think that's something that you have to shove down people's throats. I'd rather keep it in the background, and I'd rather people came to the music in an unprejudiced way. I'm glad, in a sense, that most people don't know about me, what I do, much. I'd rather they hear the music, and then say, "I wonder what kind of person created this." And, you know, gosh, the view of Islam in the West is pretty strange these days. I'd say it's ignorant and misinformed, on the whole. It's a big topic.